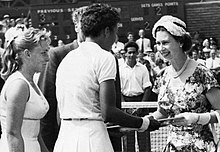 Hard congratulates Althea Gibson at the 1957 Wimbledon Women's Singles Championships. The pair were Wimbledon Women's Doubles Champions that same year. Darlene Hard (born January 6, 1936) is an American former professional tennis player. Known for her volleying ability and strong serves, she captured singles titles at the French Championships in 1960 and the U.S. Championships in 1960 and 1961. With eight different partners, she won a total of 13 women's doubles titles in Grand Slam tournaments. 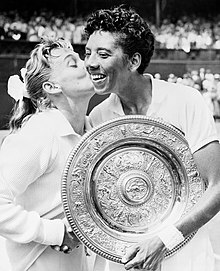 Her last doubles title, at the age of 33 at the 1969 US Open, came six years after she had retired from serious competition to become a tennis instructor. She also played the US Open singles tournament in 1969, losing in the second round to Françoise Dürr 6–3, 6–3. According to Lance Tingay of the Daily Telegraph and the Daily Mail, Hard was ranked among the top ten in the world from 1957 through 1963, reaching a career high of number 2 in those rankings in 1957, 1960, and 1961. Hard was included in the year-end top ten rankings issued by the United States Lawn Tennis Association from 1954 through 1963. She was the top-ranked U.S. player from 1960 through 1963. In 1964 Hard won the singles title at the South African Championships, defeating Ann Haydon-Jones in the final, and soon afterwards turned professional when she became a teaching pro. She later owned two tennis stores. Hard was enshrined in the International Tennis Hall of Fame in 1973. She has worked for the University of Southern California since 1981. ^ United States Tennis Association (1988). 1988 Official USTA Tennis Yearbook. Lynn, Massachusetts: H.O. Zimman, Inc. p. 261. ^ a b "Hard is fine far from Centre Court". Los Angeles Times. July 3, 2007. ^ "Inductees – Darlene R. Hard". Intercollegiate Tennis Association (ITA). This page was last edited on 5 March 2019, at 21:20 (UTC).